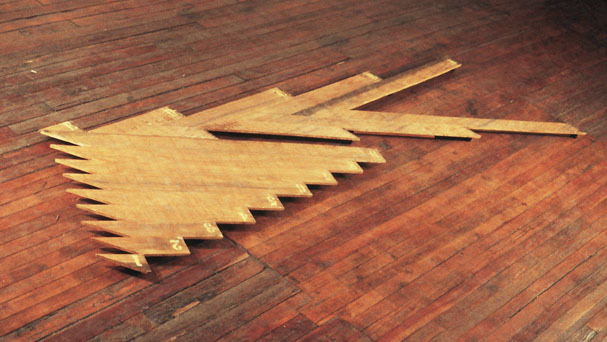 This plywood piece is a floor version of the wall hung works, Standard Revision, 36 Pieces, and Receiver Copy, from the sculpture show in 1977 at Terry Moore Gallery, St. Louis. A 4-by-8-foot sheet of found plywood was cut diagonally into two equal wedges. Each wedge was divided under different controls, numbered or lettered, then reassembled to hover off the floor. Only a handful of sawdust was discarded. H: 5 ft. 6 in. x W: 14 ft. x D: 2 in.